I feel like the word simple in reference to recipes has gone the way of other misused words like peruse and the non-existent but commonly heard irregardless. The recipes in this book are many things, but simple they are not. OK. So, three plus hours reduced to one sentence: this was a massive gnocchi fail turned into a success by persistence and will power. Also, it should be noted that the we here is pretty much Matt and his mom as I was out for the count with a stomach virus. And so we began with boiling 3 pounds(!) of potatoes. Mario wanted us to put the potatoes through a vegetable mill, but we didn't have one, so we bon appetempted it and subbed the mill for the food processor. * Then, we covered it with flour and the one egg it called for, only, after kneading for about 5 minutes, it wasn't turning into a dough-like substance. We added more flour and an extra egg, but still couldn't get the consistency into anything that would roll out into ropes. At this point, Matt and his mom were going back and forth saying: "We've got a failure on our hands!" & "Batali doesn't know what he's talking about. Three pounds of potatoes? To make four servings?! Since when is 3/4 lb a serving of pasta?" & "This recipe is wrong. Dead WRONG." *later research would reveal that pureeing the potatoes in a food processor was a gigantic mistake. Shoulda used a grater or sprung for the vegetable mill, but we did NOT want the potatoes silky smooth; we needed them to be rougher and chunkier. Our bad. With the dough runny and sticky we were frustrated, but also convinced that we were still working with the right ingredients and that there was an off, off chance this thing might still sort of work out. So, we began tossing the weird potato goo in the boiling water spoonful by spoonful. For real, what is simple about this?? We lost another sponge to the clean-up. What came out didn't look like gnocchi, but we cut it up in pieces to make it look like the real thing. Here's the real thing now. Sort of looks like chunky, weird dumplings/noodles. With the hard part finally complete. We were able to move forward with the sauce. The recipe didn't call for basil, but we were leaving for vacation and had so much from our baby potted herb garden, and since this is the first edible thing I've ever grown, I wanted to share it here. Hope that's OK with you, mario batali. Wouldn't want to jenk-up your recipe by adding some fresh basil, MARIO. MARIOOOOOO! WHY WOULD YOU CALL THIS SIMPLE?? All right, so truth be told, the sauce was pretty easy. Oh and the now traditional shot of one of our parents enjoying the fruits of our labor. Open wide! Speaking of Matt's parents: thank you for making this post pasta-ble!! Also, since this came from a book not so easily linkable. Here it is below. And if you do try it, remember, no food processor for the potatoes. Just a grater or a ricer or a vegetable mill. OK? OK. Meanwhile, core the tomatoes and chop them into 1/4-inch cubes, reserving all the juices. In a 10- to 12-inch sauté pan, heat the olive oil over medium-high heat until smoking. Add the garlic and cook until light golden brown, about 30 seconds. Add the tomatoes and their juices and cook until softened, about 2 minutes. Add the olives and remove from the heat. Drop the gnocchi into the boiling water and cook until they float to the surface, about 3 minutes. Drain. Carefully add the gnocchi to the pan with the tomato mixture. Return to the heat and toss gently until bubbling. Add the mozzarella and marjoram and season with salt and pepper. Transfer to a warmed serving dish. Serve immediately. Put the potatoes in a large pot, add water to cover, and bring to a boil. Reduce heat and cook at a low boil until potatoes are tender, about 45 minutes; drain. While they are still warm, peel the potatoes, then pass them through a vegetable mill onto a clean work surface. Bring 6 quarts of water to a boil in a large pot, and add 1 tablespoon salt. Set up an ice bath nearby. Make a well in the center of the potatoes, and sprinkle them all over with the flour. Break the egg into the center of the well, add the salt, and, using a fork, blend the egg and salt together. Using the fork, begin to incorporate the flour and potatoes as if you were making pasta. Once the dough begins to come together, begin kneading it gently until it forms a ball. Knead gently for another 4 minutes, or until the dough is dry to the touch. Divide the dough into 6 balls. Roll one ball into a rope 3/4 inch in diameter, and cut it into 1-inch pieces. Roll each piece down the back of a fork to create the characteristic ridges. Drop the gnocchi into the boiling water and cook until they float to the surface, about 1 minute. Use a slotted spoon to transfer the gnocchi to the ice bath. Repeat with the remaining dough, replenishing the ice as necessary. When all the gnocchi have been cooked and cooled in the ice bath, drain them and transfer to a bowl. Toss with the oil. 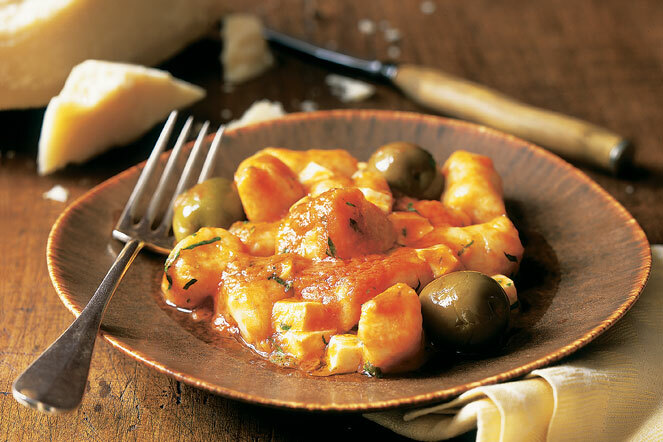 The gnocchi can be stored, covered, in the refrigerator for up to 48 hours. Since when is any recipe involving a VEGETABLE MILL simple? It's not. Your gnocchi looked good, though! I have this cookbook and haven't cooked one thing from it yet because the ingredients alone aren't very simple. Agreed. I tried making Mario's Quail Spiedini with Sage Polenta - this recipe was tough and I couldn't get the quail to come out right. The recipes are meant to look simple on the plate but the preparation, ingredient hunting and cooking of these are NOT simple. I don't think Mario's Quail Spiedini with Sage Polenta is in the Simple Italian Recipe's book. But this gnocchi is and it's definitely tough to get the dough right. It was fun being a part of an Appetempt....we turned a failure into a success and it was a lot of fun! I made this gnocchi this weekend and FYI, the 3 pounds of potatoes is for 12 servings! Might explain why it seemed ridiculous. that makes sooooo much more sense! but where did you see that? b/c in our Batali book it says "4 servings as a main course and 8 as an appetizer." ??? We had dinner for 8 and still have leftover gnocchi so I can only imagine if you were thinking it was for 4. Although, it was also served as an accompaniment to chicken marsala and we had an appetizer so clearly people didn't eat as much. Potato ricer was key, btw, but still really difficult to get it to the right consistency. It was SO sticky and difficult to roll. It wasn't until the last couple of batches when I added a little more flour that it seemed to take on the right consistency. Twelve has to be right. We had so much leftover we had to freeze it. Also, glad to hear you also had problems with the consistency...just kidding, but it does show the fallibility of recipes!